This table is a fully equipped, locking, self-contained demonstration unit. 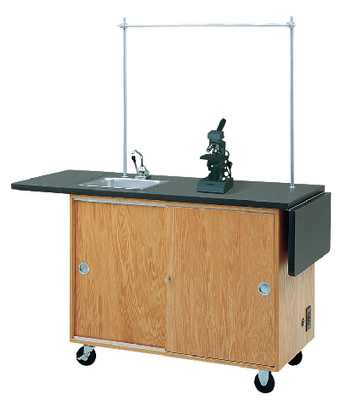 Its many unique features, such as the 1¼"-thick, laminated surface with drop leaf extensions, provide the durability and convenience necessary in today's schools. The table is made from select oak and oak veneers with a clear, waterborne acrylic finish. The cabinet features unbreakable aluminum sliding door glides and lock. The unit comes standard with a stainless steel sink and hand pump. A GFI-protected AC duplex electrical outlet is built into the lab, and the cabinet rides on 4", ball-bearing swivel casters with brakes. Ordering information: This table includes a 25-foot extension cord, two tote trays, two 2-gallon water bottles connecting hoses, two 3/4" diameter upright rods, one 1/2" diameter crossbar and clamps, and a propane burner with stand are provided. Unit is also available without the sink, faucet, rod sockets, and an upright set.